Since 2013, She+ Geeks Out has been creating networking opportunities in safe, fun, and educational spaces for women+ in tech. Our commitment to understanding exactly what drives our community is paramount. While we’ve gathered anecdotal information in the past about how the She+ Geeks Out community feels about their careers in tech and what their hopes, dreams, and fears are, we wanted to get more specific. In March 2019, 380 women+ shared their thoughts with regard to career – what they find important, how they view their future growth, and more. Participants in this survey were primarily from Boston, but some data points were taken from our San Francisco and New York City community members as well. Read on to learn some of the key insights we discovered or download the full report. *Our community isn’t just for those who identify as a woman in the more traditional sense. Some may present as female, but identify as non-binary, for example. We want to make it very clear that our community is not only supportive of those who identify as a woman in a way that is meaningful to them, but we are also intentionally including those who are non-binary and gender non-conforming as well. 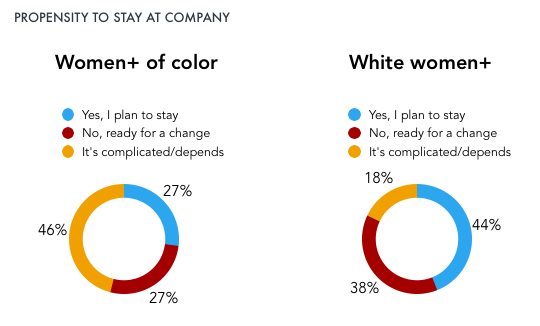 Women+ of color are most likely to leave their company or their industry. We asked our community if they would be likely to stay at their current company or in the industry. The majority of respondents are inclined to explore new opportunities, albeit stick it out in their industry. However, women+ of color are more likely to leave their company and switch to a different career path than their white counterparts. 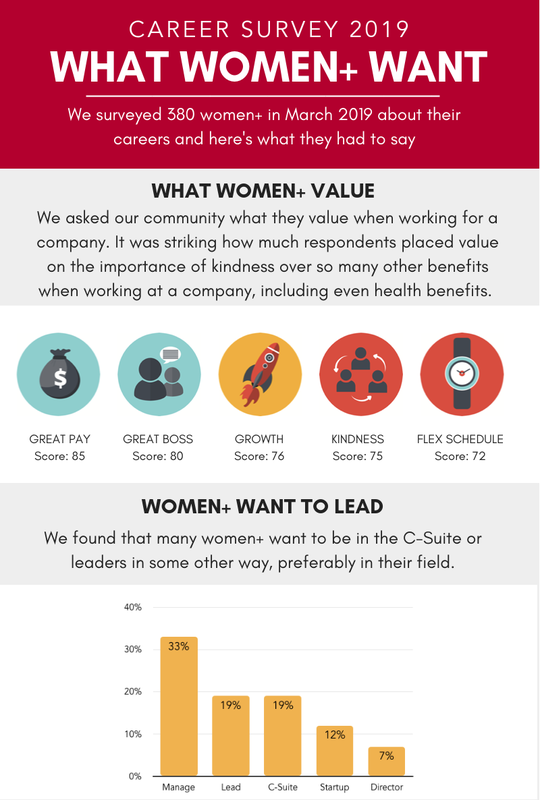 What do women+ want from a company? We asked our community what they cared about when it comes to working for a company. The top five benefits they look for are great pay, a great boss, opportunities for growth, working with kind people, and a flexible schedule. You read that right – kindness is a higher priority than health benefits and 401K matching. We asked how respondents felt about management and what they hoped for long-term. 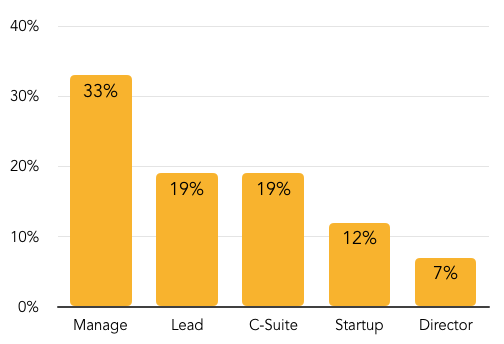 Bucking the common belief that women+ are more likely ready to exit the industry to start a family, the majority of respondents expressed a desire to manage or lead a company.